I’m putting this call out to anyone who might be able to suggest a means to learn French, whether it’s computer software, or they took lessons somewhere, or other. I’m going to ask a French teacher or two at the school I work at, because I’m surrounded by native French speakers. Why French? Well, for those who don’t know, I live in Canada, which is an officially bilingual country. 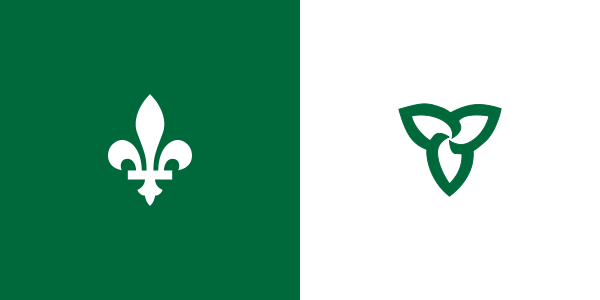 However, I live in Ontario, which is officially unilingual even with its large French population (the largest outside of Quebec, if I’m not mistaken). Sure Mandarin and Cantonese are probably spoken more in Toronto than French, and Yiddish would definitely help more with my grandparents, but if I’m going to become King of Canada (that’s my career goal, btw) then I need to ensure there’s no uprising in French communities due to a monarch who doesn’t speak their language. What worries me is my learning disability. From what I’ve gathered from my mother (a former Special Education teacher) and my own observances of Adult-Adam (we’ll just call him “Adam”) is that my learning disability manifested itself through my reading. When faced with a word, I’m not able to effectively string together the series of sounds, rather I see the letters, the sounds they make, balance that with my rather large vocabulary and take an educated guess based on the context. Fortunately I do have a large vocabulary, and understand the ground rules of grammar. Sure I’m pretty lazy, and generally don’t edit my entries, and so there’s usually some grammar errors or typos, but if I were more fastidious then I could eliminate them. In addition, I tend to write in a rather personal manner, rather than formally; this part is probably a lack of post-Secondary education. I can see these things manifesting as I watch myself reading and writing. There are words which are foreign to me, and I’ll spend years mispronouncing because I don’t know any better, or words which I know the proper spelling of and the proper pronunciation, but whenever I see it on paper (or screen), I spend an exorbitant amount of time trying to figure out what it is. The best example is misogynist. That just took someone who types 120 words per minute about 15 seconds to type… but I got it right! I look at that word and I have no idea what it is, I know the word, I know the spelling, I know the definition, but the pronunciation, which then would lead my brain to the other attributes of the word is difficult for me to come to. So to any journalists I know, please stop using that word. So this leads me to French, my vocabulary is tiny, and my understanding of the grammar is smaller. I think this was my failing in grade school, and to have added Hebrew on top of that, was more difficult. How can I learn a language if my coping mechanisms are reliant on a working knowledge of the language? Unfortunately I don’t know of any good ways to learn it, because I’ve always done so in an academic setting (I did Immersion) but James is taking lessons at Alliance Français (http://www.alliance-francaise.ca/). Talk to him about it! Allegra beat me to the punch. Join me! It’s a lot of fun, but a major time commitment. I’m not sure how your work schedule is, but I found twice a week (4 hours plus homework) to be a bit much, so I’ll be switching to once-a-week lessons (3 hours plus homework). Also worth noting is that you can write your classes off as school tuition on your taxes. hey adam, i never knew you have a learning disability. i think in this context you might be able to overcome that, because you will be learning how to arrange the letters in new ways and pronouncing sounds we do not use in the english language. i think it’s great you want to learn! i have a friend who did courses–i’ll ask her. I borrowed Rosetta Stone, and I’m trying that out. Did a couple of rounds. After the first round, I was confused at their philosophy so I researched it, and the software’s supposed to immerse you in the language, but I find I spend my time translating it, because I know enough French from having lived in Canada all my life. Kristin, yup I have a learning disability, now it makes sense why I’m so dumb.